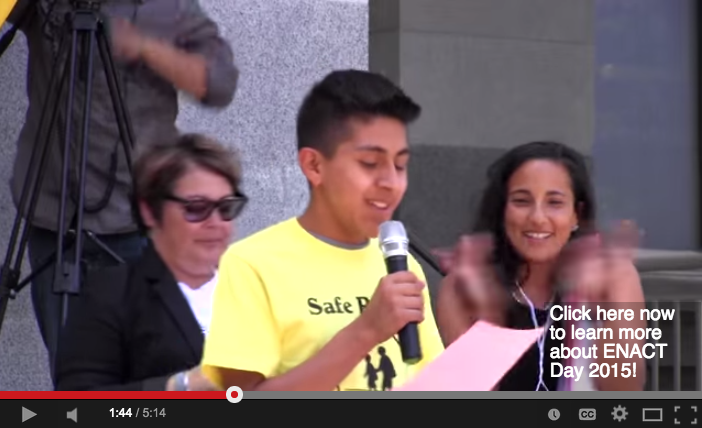 Join us in Sacramento for ENACT Day 2015! For more than a decade, California health advocates have converged on the Capitol for ENACT Day. ENACT Day is a prime opportunity for community coalitions, grassroots organizers and advocates to develop policy advocacy skills. We’re excited to announce that registration for ENACT Day 2015 is now open! A limited number of travel scholarships are available. If you would like to apply for a travel scholarship, you must register by April 8th and indicate your interest in a scholarship on the registration form. This will help us determine the potential need for travel assistance. register early to help us determine fundraising needs. Last year, more than 200 advocates representing over 50 California communities gathered at the Capitol to rally behind A Healthy Future for California, our policy platform, and advocate for four key bills to improve health, safety and equity. Relive ENACT Day 2014 with our new video--and please share with friends and colleagues who are thinking about joining ENACT Day this year! Watch and share our new video, capturing the highlights of ENACT Day 2014.